Level Term: Simply stated, Level Term provides you with a fixed amount of coverage (the amount of money the policy is worth to your heirs) with premiums (your cost of owning the life insurance) that are also fixed over a defined period – usually in ten-year increments up to thirty (30) years. Decreasing Term: With this type of life insurance, your coverage decreases throughout the term; however, your premiums remain level (the same). 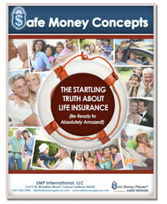 Convertible Term: With this type of life insurance you (the policy holder/owner) have the right to convert your term policy to a permanent policy (more on “permanent” insurance in just a moment). Group Term: The key word is this type of insurance is “group,” and it refers to the type of life insurance an employer or professional organization, for example, offers to its employees or members. Since Group Term Life Insurance is intended to cover several to possibly hundreds of people, it usually results in each person paying a reduced premium; however, most Group Term policies are not portable which means that the coverage ends when you cease employment or membership in the group.